Despite her forty years and a successful career as a rock journalist, Jancee Dunn still feels like a teenager, especially around her parents and sisters. Looking around, Dunn realizes that she’s not alone in this regression: Her friends, all with successful jobs, marriages, and families of their own, still feel like kids around their moms and dads, too. That gets Dunn to thinking: Do we ever really grow up? Why Is My Mother Getting a Tattoo? explores this phenomenon–through both Dunn’s coming to grips with getting older and her folks’ attempts to turn back the clock. 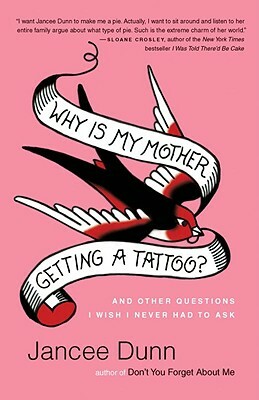 In a series of hilarious and heartwarming essays, Dunn conspires with her sisters to finagle their way into the old family homestead, dissects the whys and wherefores of her parents’ obsession with newspaper clippings, confronts the seamy side of the JC Penney catalogs she paged through as a kid, and accompanies her sixtysomething mother to a New Jersey tattoo parlor, where Mom is giddy to get a raven inked onto her wrist. And Dunn does it all with humor and insight. Jancee Dunn is the author of the novel Don’t You Forget About Me and the memoir But Enough About Me. A former writer at Rolling Stone, she was a correspondent for Good Morning America and an MTV veejay. She has written for The New York Times, GQ, Vogue, O: The Oprah Magazine, and other publications. She lives in Brooklyn, New York, with her husband, writer Tom Vanderbilt.